Machine Tending – Galim Software And Systems For Industry Ltd. Unlimited number of parts definable on setup screens. Scalable for a variety of architectures. • Map screen which shows current status of parts on machines, robot etc. • Possibility of manual intervention in case of parts removal etc. • Start Stop buttons etc. (after translation of text file). • Operator Language selectable at any time. • Alarms prominently displayed with diagnostic data available. from entry of each part to system to exit including details of process”s etc. Integration of measurement or tests within process cycle. 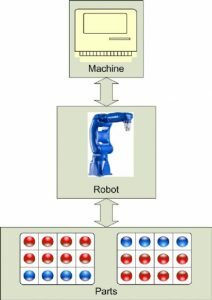 Has been implemented with robots of maked Yaskawa, Fanuc, Nachi. 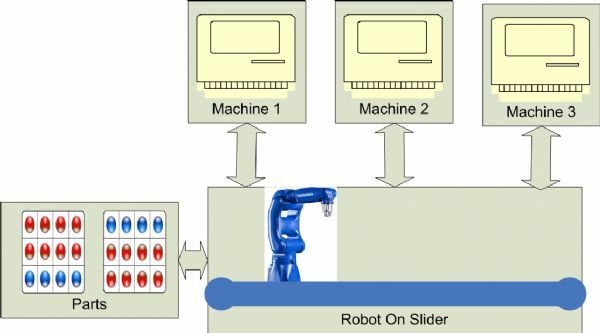 Can work with any robot which has socket messaging possibility or Modbus connectivity. One Robot loading/unloading parts to/from one machine from/to trays or shelves. One Robot on a slider loading/unloading parts to/from two (or more) machines from/to trays or shelves. 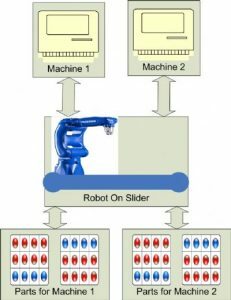 One Robot on a slider loading/unloading parts to/from a sequence of machines such that a number of processes are performed on each part.